Do you want to level up your impact, authority, and profits confidently by using Live Stream Videos? But maybe you’re just too afraid? Or are you not sure where to start with the tech and gear? Perhaps the idea of going live in front of the camera makes you want to jump off a cliff?! Well, do not fear, this article will help! Live video isn’t exactly new. When Google launched their (now dead) social network Google+ back in 2011, they had Google Hangouts on Air. This was a live video platform way ahead of its time. And even before that, there were various live video platforms to help you communicate your message to the world. But a few things have happened. Internet speeds are faster and smartphones are powerful enough to encode live video. Live video is the new (old) shiny tool right now. But does that mean it’s right for you? It’s not enough to embrace live video because it’s new and shiny or because everyone else is doing it. In fact, that’s a very bad reason! It allows you to be more authentic – and more direct. Through you being more you, it helps your audience have more empathy for you and your business. It allows viewers exclusive access to you – this makes them feel special. Once you get the tech sorted, it’s actually easier to create content quickly. You can be more spontaneous. Blogging has changed my life. 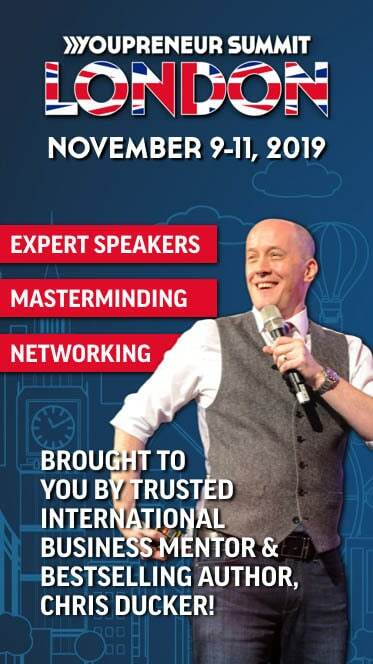 One blog post launched my speaking career and helped me speak at Social Media Marketing World. Another blog post on Facebook Live, had over 4 million page views and helped me achieve over 300 course sales without any ad spend. But, it takes me ages to write blog posts. Days and days of research, and time and effort putting it all together. But once you’ve got the tech sorted, you can create killer content quickly in the form of a live video. And then from that, you can repurpose into blog posts, podcasts, social media posts and more. It’s saved me so much time! But let’s not forget profit generation! One of my live video course members shared with me an amazing story. After broadcasting live, she was able to create a live event which earned her over $10,000! She was able to do this by putting her face in front of the camera. And communicating how amazing her event was going to be with her audience. Her story is not a lone one. Live video can help you earn money! With dying reach on Facebook, it’s becoming more difficult for our voices to be heard on our Facebook pages. In a study from Agorapulse, they found that live videos receive 75% more shares than uploaded videos. I hope I’ve managed to convince you of the power of live video! What do you need to go live? Anything else is the cherry on top! More on that in a bit. I’ve worked with hundreds of people round the world on live video, and I hear the same excuses all the time. I come up with the same excuses myself! Becoming more confident with live video is not just about being a master of the tech. It’s a case of shifting your mindset. I decided to put the main barriers people struggle with into a little word cloud. I’ve discovered that there are 3 main barriers that stop people from going live. Does the idea of going in front of the camera make you nervous? Being able to communicate your message to your audience via your camera. You’ll need clear diction (no mumbling allowed) and project your voice with energy while being authentically you. Getting frustrated with live video tech? Being able to use your live video tech and gear confidently so that you are free to communicate your message. When things go wrong, you’ll have a clear checklist to follow and a backup you can rely upon. You’ll know exactly what you are going to communicate and why. Although you won’t need to rely on a script, you’ll have a clear structure and be able to give real value to your audience. And of course, a strong call to action! It’s ok to be nervous. Most people doing things out of their comfort zone get nervous. It’s also clear that many people suffer from imposter syndrome. I’m an expert at it! And from speaking with some influential friends of mine, it often gets stronger the more successful you get! But instead of giving in to the fear, why not use it to channel your energy into your live video shows? Let those butterflies and the adrenalin allow you to give your best. I trained to be a professional classical singer at a UK music conservatoire. After I graduated, I remember singing a very difficult solo at the Liverpool Philharmonic Hall with choir and orchestra. At the rehearsal, my voice had cracked on a high note. As I was about to walk on stage, saying I was nervous would be an understatement! But as the adrenalin kicked in, I gave what was the best performance of my life. It was amazing and I thoroughly enjoyed it. The following week, I was the soloist at a smaller concert. It was an easier piece, but I was totally complacent and not nervous at all. My performance was pretty awful. Start with why you’re going live. So many people go live just because other people are doing it or because it feels cool. There’s nothing wrong in playing with new technology, but for your live video to be successful you need to know your why! It will also help you remain consistent and know whether you are being successful or not. I can’t tell you your why, but I can share my experience from working with others. One of the big advantages in going live is that it gives you much more visibility and creates brand awareness. If your audience see you going live regularly, you’ll be far more likely to be front of mind. It also allows your audience to have access to you since live video is a very intimate affair. If done right, your audience will feel like they know you much more and be able to ask you questions. And that brings me on to another important point – live video allows you to be real and authentic. As humans, we crave authenticity. It’s what has been missing in business to business relationships for far too long. Live video is one of the most powerful formats to build strong and authentic human to human business relationships. That’s the high-level view: know you need to know what you actually want to do in your live videos. Do you want to share your knowledge or expertise? Do you want to sell a product or an event? 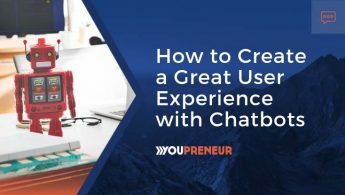 Do you want to interview guests so you can build your audience and connections? How about sharing behind the scenes footage or your thoughts and ideas? Of course, you can do a combination of these things, but come up with a plan of what you want to share. Now that you have your why, it’s much easier to get started and stick with it. Over time, you will need to tweak your why or your show format. That’s fine, but you need to start with something. And this will help you stop procrastinating and actually launch it! Live video does not need to be perfect. In fact, one of the things that attract people to live video is that it’s real and raw. Far more so than all the slick marketing videos your audience are subjected to. But that doesn’t mean you should just go live without preparation. It’s vital to practice the art of live video. With practice you can become confident with your delivery, the tech and your content. Live video technology is far easier now than when it was when I first started. But still, there can be a lot to think about. A dodgy internet connection can be a disaster and make you want to give up. If your sound is bad, then people won’t bother to watch you next time. 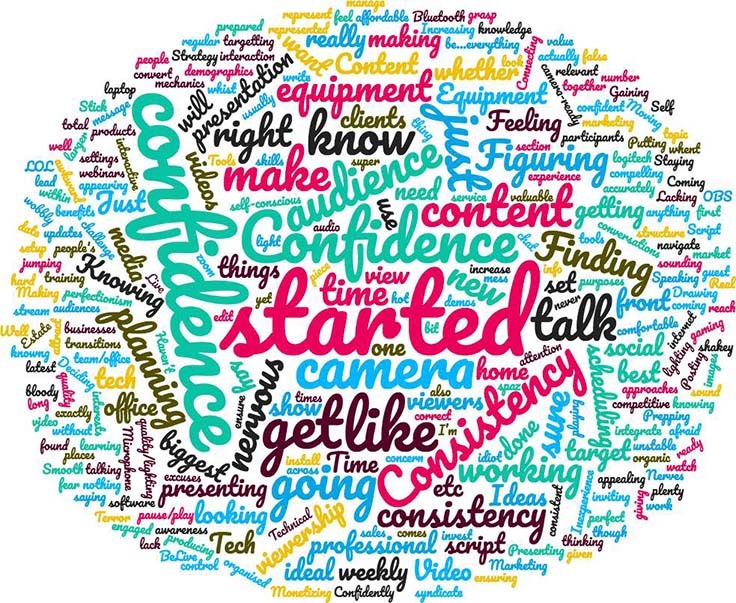 The only way to become more confident in front of the camera is by actually doing it – regularly. I recommend joining a live video challenge. 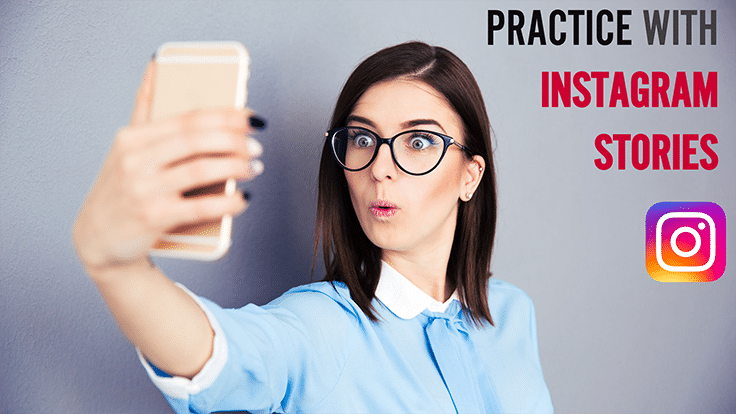 This way you practice going live in a safe environment (such as a Facebook Group) with other people that are wanting to practice. When I first started off, I had the mad idea of going live twice per day in the twelve days running up to Christmas. I did a “Christmas Carol of the Day” where I performed a cryptic version of a well-known Christmas carol live and asked people to guess what it was. In the evening I went live and revealed the answer and performed the carol with my family. It was a lot of fun, but boy did a lot of things go wrong! Over those twelve days I learnt so much from mistakes and the tech going wrong. The only way to get started and improve is to actually practice. Maybe the idea of practicing within a group is still too scary? Well, did you know you can practice going live to just yourself? Just head to your Facebook profile on your smartphone and create a live video post. 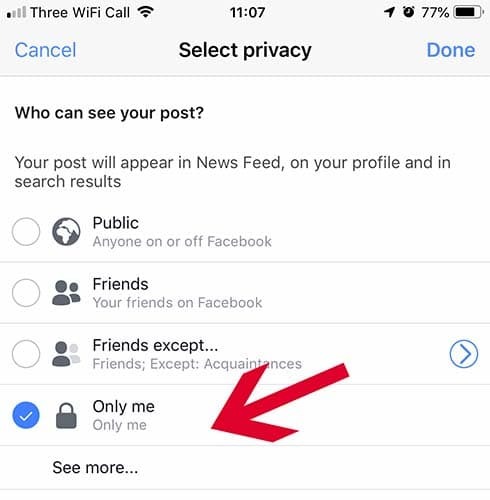 Then change the privacy setting to “only me”. Now the only person that can watch your live video is you – when you watch the replay. Even if you don’t get that nervous, it’s still well worth using this feature for testing. I still regularly do this, to test that my internet speed, video and sound are ok.
A few minutes after you click that “end broadcast” button, head back and watch the replay. If you’re like most of us, you will HATE watching yourself, but be strong and learn from the experience. When you do this, write down THREE things that you did well. Resist the urge to focus on the negative. Once you’ve done this, then write down THREE ways you could improve this for next time. Be constructive! Do you like to overcomplicate things? Before creating your state of the art live video studio, start with the basics! I mentioned earlier – you only need two things: a smartphone and a decent internet connection. Start with your basic setup – you can always add extra gear or tools. You could invest tens of thousands of dollars in building a live video studio. But unless you have the funds, are totally committed to live video and can guarantee an amazing return on investment, this is not the way to start for most people. I am a great believer in bootstrapping your live video studio. Start simply and slowly build it over time. I started with a basic set up, but over time I added microphones, cameras and lighting. I started using more advanced tools such as Ecamm Live, Wirecast or vMix. These things enhance your live videos, but you don’t need them. Get the basics sorted first and then, over time, add to your setup otherwise the tech can get in the way and become an excuse to not do it. 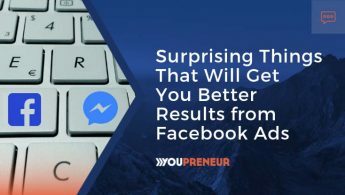 Instagram or Facebook stories are a great way to become more confident in front of the camera. Instagram story videos are only 15 seconds long and are only visible for 24 hours. So, what’s the worst that is going to happen? Why not share little video snippets of what you are up to each day? Share what you are working on, your latest product or service, or what you’re doing for fun. Commit to producing video stories consistently for 7 or 14 days so that you can get into a routine. Instagram or Facebook stories are not live video. But sharing regular Instagram video stories is a great foundation for confident live video. One mistake most of us make when making any videos of ourselves is not actually looking at the camera. If you use your camera’s front-facing camera, then it’s actually very difficult to focus on the camera. That’s partly because the camera is tiny, but mainly because there is a huge image of ourselves which we end up focussing on! That’s not to say that we’re all narcissists! It’s because as humans we’re wired to engage with other human beings. So if your brain has the choice between focussing on the image of your face or a tiny piece of plastic (your camera), it’s going to choose your face! I’ve seen so many videos where people are not actually looking at the camera – they’re looking slightly away – looking at themselves. And it’s far less engaging and quite off-putting. When people look directly at the camera it feels like they’re actually talking to you and it’s a very different experience. I found this a very difficult habit to change and it took practice. It’s particularly difficult when using your phone. You could use your back-facing camera. The back camera tends to be of a higher quality, and it means you won’t see yourself. The downside is that it is more difficult to start and stop your broadcast and you won’t be able to see comments. If you use your front facing camera, I’ve got a very low-tech solution for you! Put a sticker right next to the camera and draw arrows pointing to the camera (preferably in red ink). This will help your eyes focus on the camera and less on you. You could also turn down the brightness of your display so that it’s easier to focus on the camera and not your image. If your broadcasting from your laptop or desktop using a webcam I have an equally low tech solution! Get a piece of paper and draw 4 arrows pointing into a space in the middle. Then cut out a hole and put your webcam through. Again, this will help train your brain into focussing through your camera and not look at the display. Always have your camera at just above eye level. You should never have to look up to your camera. This is less flattering and gives more of your chin than your eyes. Also, try and look through your camera and imagine you are talking to your best friend or client as if they were a foot behind the camera lens. It’s important to always be you. But we need to amplify you. I call this heightened authenticity. You don’t need to be as energetic as Steve Ballmer in this infamous speech, but most people need to raise their energy levels by at least a couple of notches! The quality and strength of your voice are so important as you communicate to your audience. It’s vital to keep it fit and healthy, and to improve the energy, diction and vitality of it. Your voice isn’t just your vocal chords or your larynx. It’s also your body. So, check your posture! 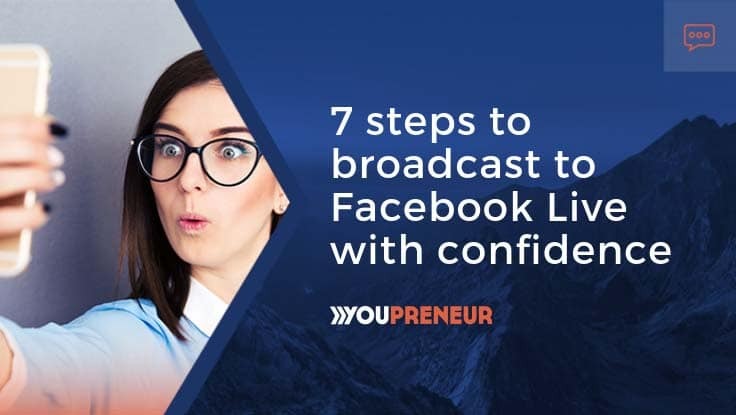 If possible, stand when you’re going live – it’s easier to put more energy in and support your voice if you are standing. I recommend doing vocal exercises each day and 10-20 minutes before you go live. This will give you more vocal strength, energy and better diction. And it’s also great to have a bit of fun and energy before you go live! There is a great app called Voice warm up from my friends at Vocal Process. It gives you 1 minute exercises designed to help you with breath control, releasing tension, diction and interesting voice. It’s available for iOS and Android. So after all that practice, you feel so much more confident and ready to go live. You hit that go live button, but everything goes wrong. You get a “your internet connection is unstable” message, then you realise the kids are watching Netflix downstairs! Your phone starts ringing, your computer crashes, your cat jumps on the table and knocks over your webcam, or something else! I’ve had personal experience with all of those things and they could be avoided! Pilots have a checklist they have to stick to before they can fly the plane. It’s vital to check everything is working and to do many safety checks. It’s important to have a live video checklist that you follow every time you go live. For example, always check your internet speed before you go live. If you find out that your internet speed is too low or unstable once you are live, it’s too late. I recommend downloading the Speedtest app, which is available for iOS and Android as well as Windows and Mac. You should be aiming for at least 4 Mbps upload speed for Facebook Live, but preferably higher just in case your speed fluctuates. If you’re having issues, then testing beforehand allows you to explore alternatives such as switching to 4G or going to a different location. Here is part of my checklist. Feel free to copy, tweak and make it your own. Hardware Check: Reboot your computer or phone. Close down as many apps running in the background as possible. Background check: Check your background. Set up backdrop (if needed) and lighting. Preview with camera. Switch off internet devices: If possible, disconnect any devices around your house or office from the internet. For example, other computers and tablets. You won’t want one to be downloading the latest version of its operating system while you’re live! 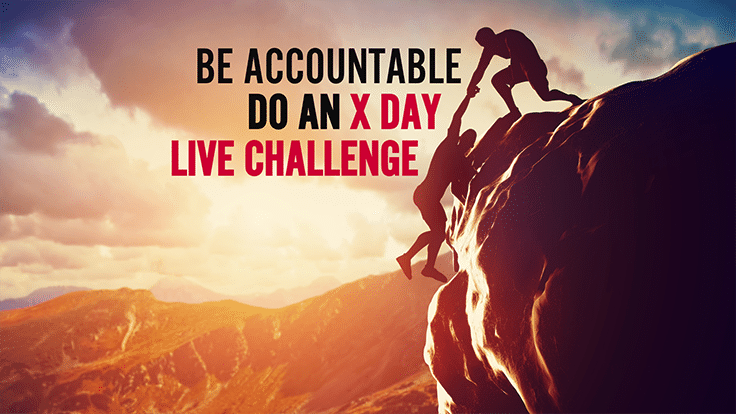 Live Test: Practice a test live by going live just to yourself on your Facebook profile. Watch back to check audio and video are good. Switch off interruptions: mute devices such as alarms, phones etc. If at home or your office, alert people that you’re going to be going live. Switch off notifications on your computer. If you haven’t pressed that big go live button yet, I hope the above tips are going to help you. If you follow even a few of them, I know they will make a big difference. If you’ve already started your live journey, it’s time to up your game, and start communicating more effectively with your audience. I’d love to know how you get on, so please let me know. And of course, there are loads more things you can do to improve your live videos. So, what are you waiting for? It’s time to level up your live video! 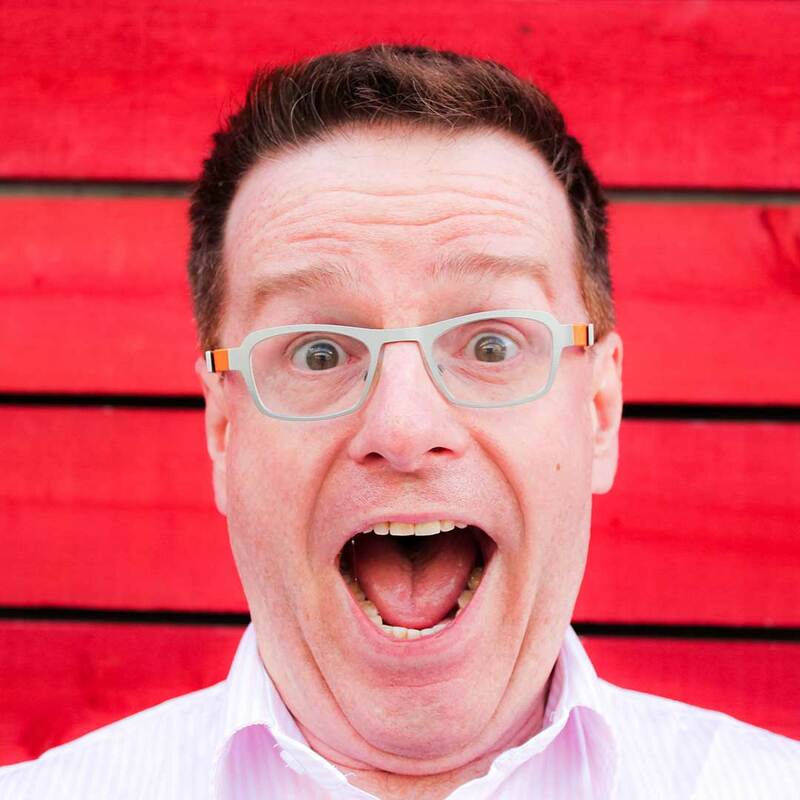 Ian is a live video consultant & founder of Seriously Social & the Confident Live Marketing Academy. 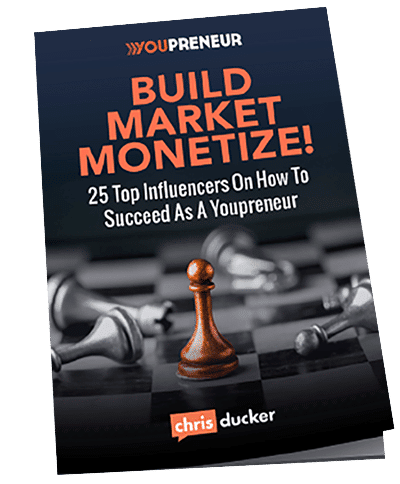 He helps entrepreneurs to level up their impact, authority, & profits confidently by using Live Stream Videos. 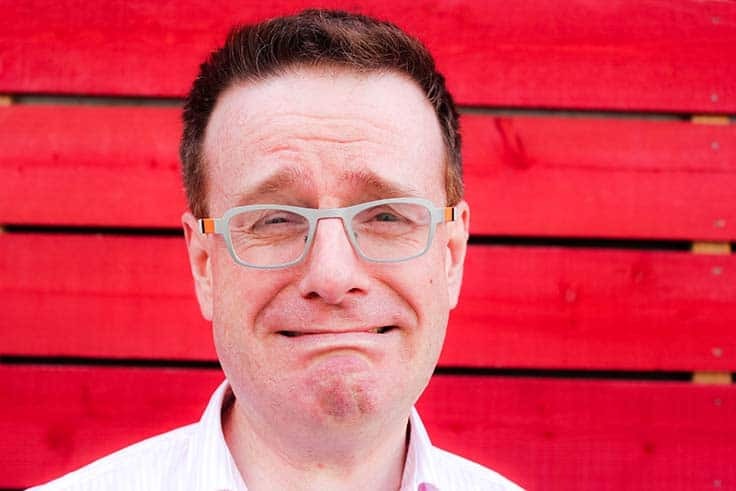 He’s an international keynote speaker & a regular speaker at Social Media Marketing World.